No, seriously, I can’t really add much to that stellar headline that would make it more eye catching. Let’s face it, if someone casually remarks to you on the subway or bus that Superman’s best pal and trusted ally was a Nazi, it would make you pause and take notice. And the fact that this startling statement comes from someone who has decent hygiene and isn’t also asking you for spare change, well, that would only heighten your curiosity, wouldn’t it? And I am here to satisfy that curiosity. 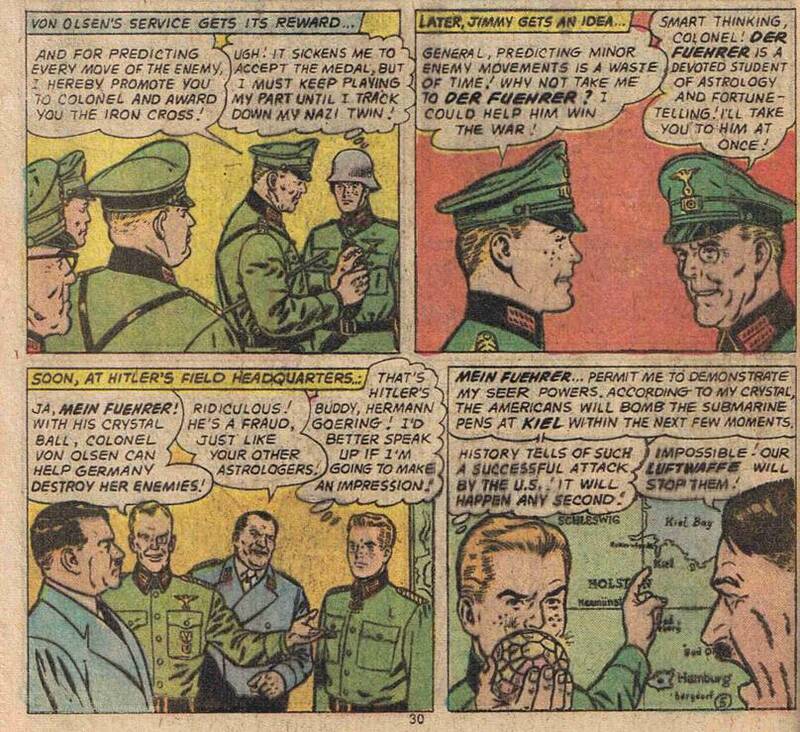 Firstly, for those of you who don’t find the premise of a Nazi entrenched Jimmy Olsen amusing, I would suggest you click away as fast as you can. 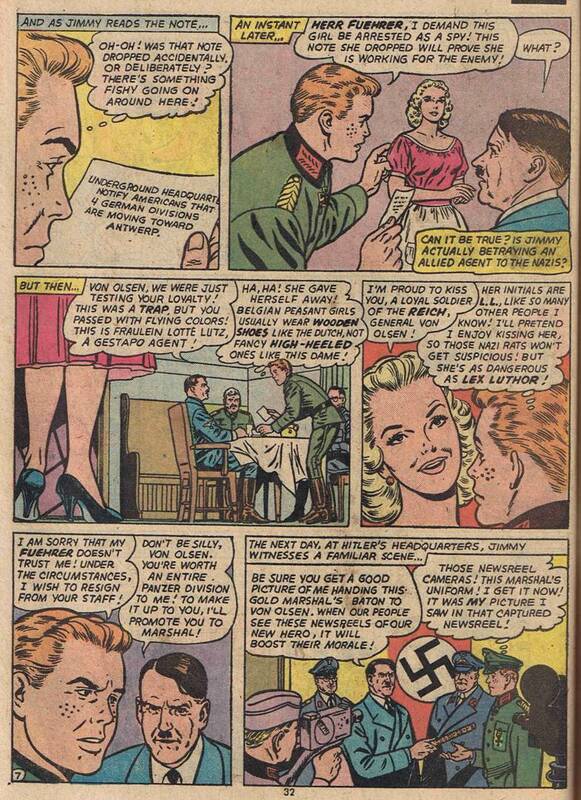 For the rest of you who Googled “Jimmy Olsen Nazi” and thereby stumbled onto this website, I bid you welcome – and I was just wondering, does anyone out there have any change they could spare? Seriously, I’m curious to see what happens to my hit counter with this entry. 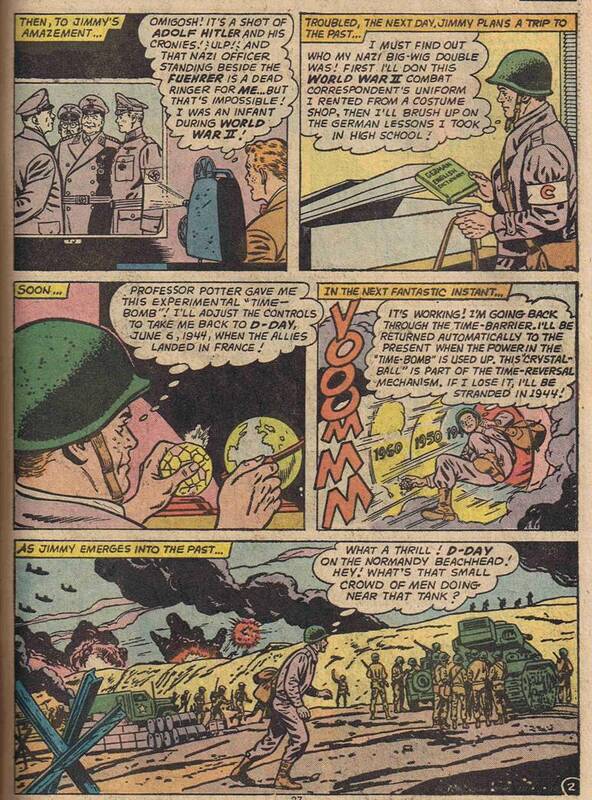 I mean, how many people out there are going to type “Jimmy Olsen Nazi” into a search engine and come here? I may actually see the darned counter go backwards. Freaky. Character defining moment #1: While everyone else is watching the rare film in the dark, Jimmy is oddly focused on the stacked cans of film, his briefcase conveniently opened and facing the coveted reels. So, yeah, I completely believe that one reel “accidently” fell in his case. Whoa, whoa, whoa! Just one second! Professor Potter GAVE Jimmy a “Time Bomb”? Really? A freckle faced kid is the best person to take care of a time machine? 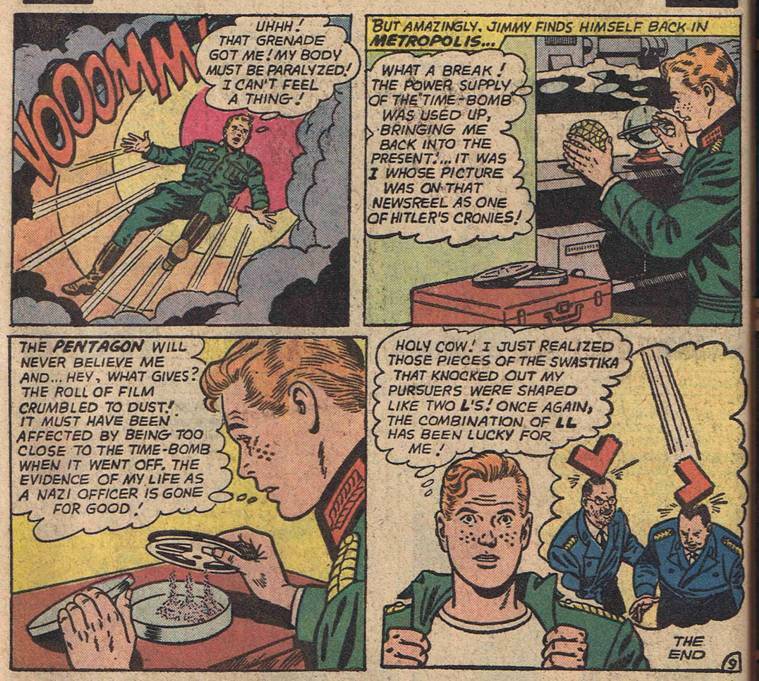 Methinks maybe Jimmy was “given” the time bomb the same way the reel of film “accidently” fell in his briefcase. Just saying. Brownie points to anyone who can figure out who Jimmy’s “German Twin” turns out to be. I guarantee it isn’t a shocker. I guess security was more lax back in the day. Back in WWII, chemical warfare was (fortunately) not readily used by Germans against American forces. The fact is that even though both sides had these weapons, they withheld using them for fear of a significant reprisal. It was sort of like a mini-Cold War during an actual war. Uhm, okay. Fritz here isn’t the brightest bulb there is. Amazing how fast the American troops doffed their uniforms and filled them with straw, isn’t it? “Hogan!” Ah, Colonel Klink. 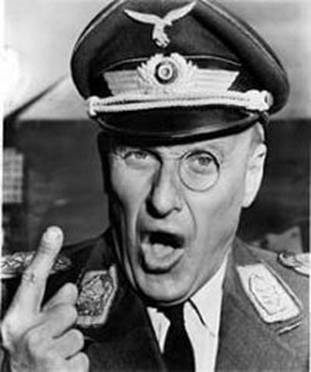 I wonder if General Fritz was the inspiration for the good Colonel? I mean, the monocle is a dead giveaway. Fun fact, gases tend to go where the wind blows them. If Jimmy had actually used poison gas, the cloud he created would’ve blown away, and quite possible back towards the German troops and Jimmy himself, depending on the breeze. 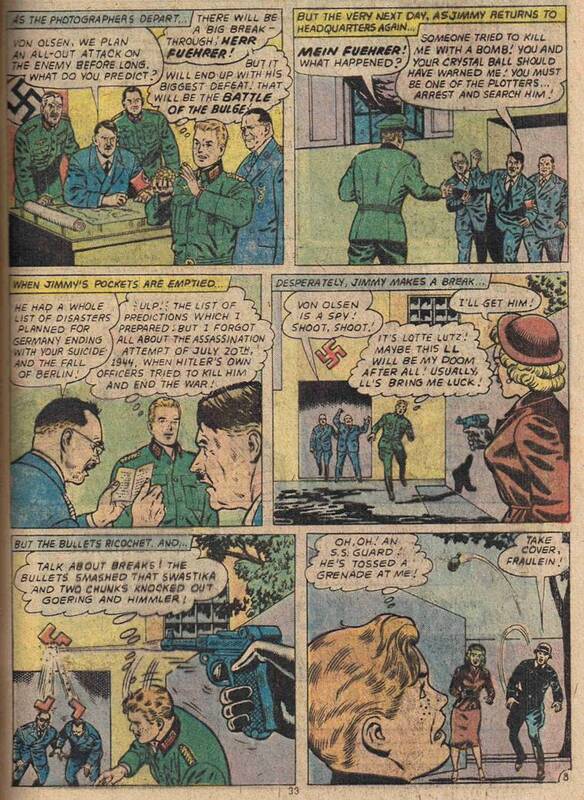 For this reason Fritz should have been peeved at Jimmy’s tactic – but in true Sergeant Shultz fashion he SEES NOTHING, and is instantly enamored by the sparkling ball Jimmy holds up. So, without checking up on Jimmy’s background, Fritz promotes the kid in a non-regulation uniform to Captain and his trusted aid. And now, Jimmy thinks, as a Nazi officer he’ll be able to find the identity of the Nazi Officer who looks exactly like him. Okay, in this story, Jimmy is our Sergeant Schultz. Also, I don’t know what school Jimmy attended, but it must’ve been pretty good to teach such flawless German. No one’s even questioned his accent, it’s amazing! He’s been promoted again? To Colonel? I could be wrong, but isn’t there usually some paperwork involved in this kind of thing? 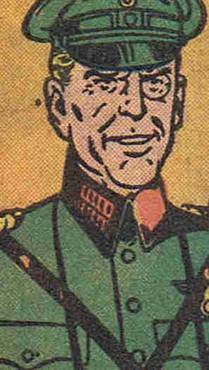 Wouldn’t someone get suspicious when they notice there isn’t a Von Olsen anywhere in the German military? And within a short while the kid’s brought within shooting distance of der Fuehrer himself. So, Hitler has his doubts. And rather than check Jimmy’s credentials they decide to test him. The resemblance between Moe Howard of Three Stooges fame and der Fuehrer is uncanny, isn’t it? Give yourself a pat on the back if you figured out Jimmy is his own twin. I don’t know about you, but if I were in charge of a secret police cartel, I’d be wary of the competence of anyone with the name Lotte Lutz. You know, I thought Jimmy was getting comfortable in his role as a Nazi stooge, and then he flubs it. Nice shooting Lotte! Remember what I said earlier about hiring someone with the name Lotte Lutz for your secret police? 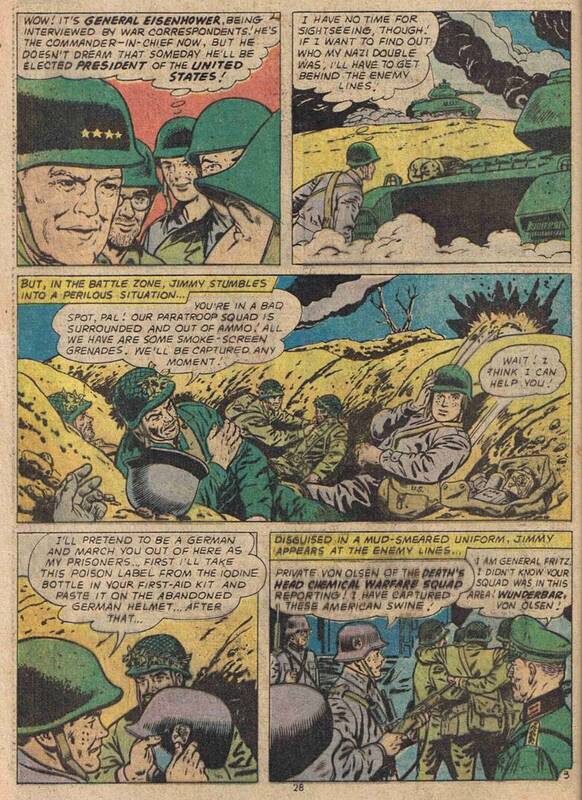 And the capper… two of the highest ranking Nazi officers are lying prone on the ground, so what does their trusted SS Guard do? HE HURLS A FREAKING GRENADE RIGHT AT THEM!!! BRILLIANT! And there you have it. 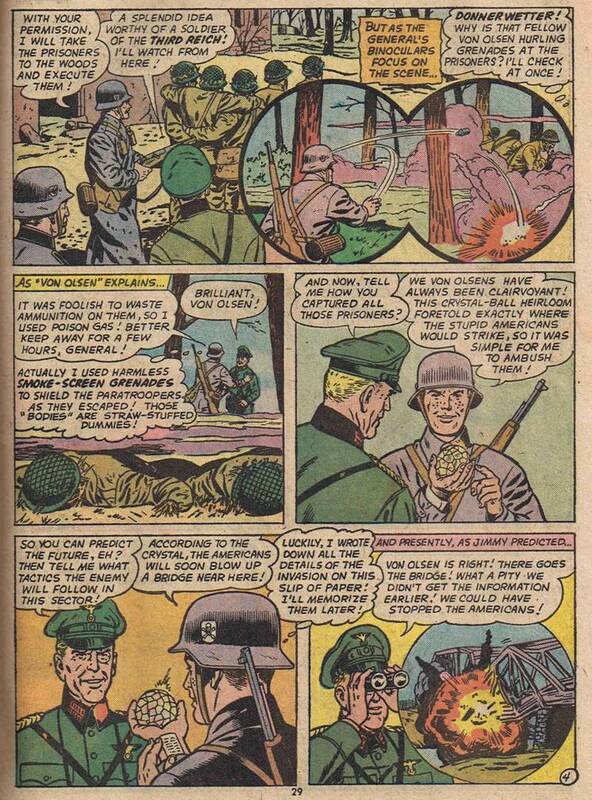 Honestly, I’m a bit surprised that during their more conservative era of comic book publishing history, DC had the cajoles to publish this story, complete with Swastikas and talk of gas death squads. 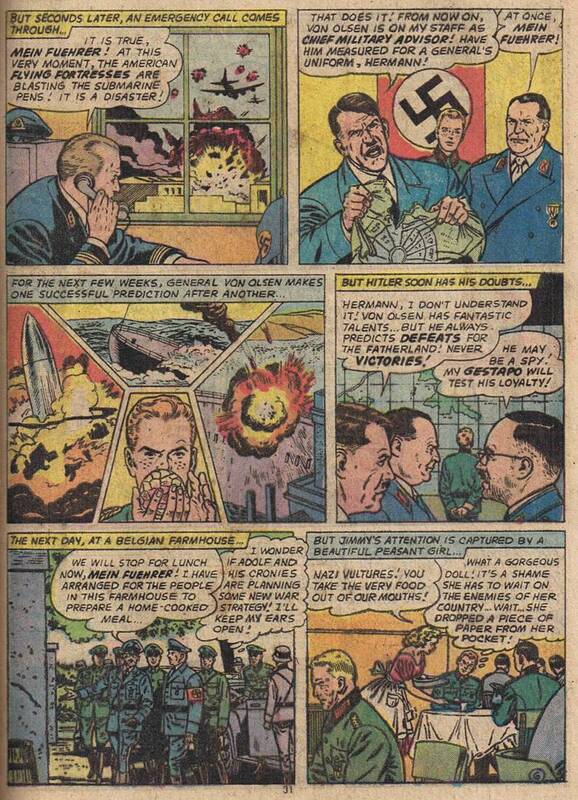 I guess it helped that they made the Nazi high command appear even more idiotic than Jimmy, but any sensible kid would then question, after reading this story, why on earth did it take 4 years for the Allies to beat these guys?